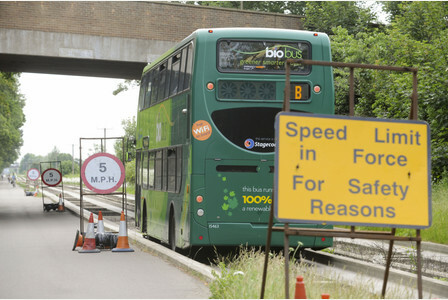 Hertfordshire County Council (HCC) have finally agreed to drop the idea of converting the Abbey Line into a guided busway following strenuous campaigning by ABFLY which saw over 500 people writing to the County Council in protest against the idea. The proposed Hertfordshire Bus Rapid Transit (BRT) network is amended to serve Welwyn Garden City, with the potential to extend further eastwards to serve Hertford and Harlow. (It will) no longer include the Abbey Line railway. Instead St Albans could be served by an additional BRT spur from the main route along the A414, or via a BRT interchange with the Abbey Line when the long term future of the rail line is agreed. To hear more on this, come along to the ABFLY public meeting at 7.30 pm on 20th November at Stephens Parish Centre, Bricket Wood, more details here.